Golden Gate Fields concluded a successful fall meet on December 10 with very strong year over year gains in handle. The all-source handle saw a double digit increase of 12% while on-track handle was also up, showing an 8% gain. Total on-track attendance for the fall meet was steady, with a slight increase from 2016. 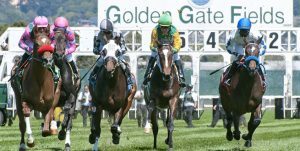 The gains from the fall meet continue the overall upward trend of 2017 at Golden Gate Fields. The bayside track saw increases in both attendance and on-track handle at the conclusions of the winter/spring and summer meets. Juan Hernandez led all jockeys in wins during the fall meet with 38 trips to the winner’s circle. 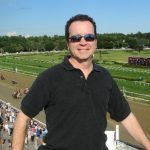 Trainer John Martin, who won 3 races on closing day Sunday, scored a 21-20 win total over Jonathan Wong in the training standings. In fact, Martin and Wong were tied with 20 wins apiece heading into the last race of the meet. Country Road, conditioned by John Martin, made a last to first blitz to the front in the finale to secure the training title for the Martin stable. Hernandez and Martin also won the jockey and trainer titles at the 2016 Golden Gate fall meet. Racing resumes at Golden Gate Fields on December 26 with an early 12:15 p.m. PT first post. The winter/spring meet, which is the longest of the three live racing seasons at Golden Gate Fields, runs through June 10.